When a loved one can no longer remain at home, the Methodist Home provides a caring, professional alternative. Long-term residents benefit from the Home’s skilled nursing rehabilitation program that addresses ambulation, feeding and grooming, communication and preservation of joint mobility. Memory-impaired residents can take advantage of the Home’s innovative therapies and equipment (iPads, iPods, etc.) to improve functional skills and outcomes. 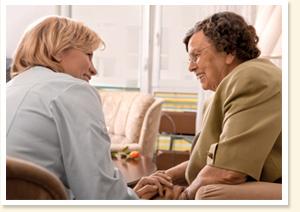 Residents with dementia and Alzheimer’s disease also benefit from our dementia-certified specialists. Experienced staff members. As soon as residents arrive, our staff works to develop a close rapport, encouraging them to participate in a wide range of daily activities from sensory stimulation to cognitive games, dancing and music therapies. Many of our nurses, nursing assistants and support personnel have made the Home their life’s work, caring for our residents for many years. Personalized care plans are created by a multidisciplinary team that includes physical therapists, a doctor and other professionals from our nursing, therapeutic recreation, nutritional and social services departments. Collaboration of care with attending physicians from our Geriatric Teaching Affiliate, Columbia University College of Physicians and Surgeons, and other top New York teaching affiliates.